Have what it takes to work with us? Test your Dev skills! MakeMeReach is growing, and we're looking far and wide for developers to help us continue building the ultimate ad tech solution! 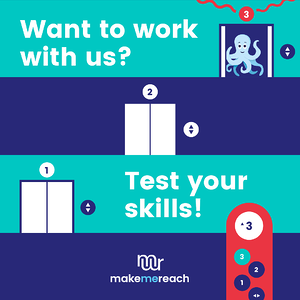 Here at MakeMeReach, we're swimming in interesting work every day, using the latest technologies - and we're rapidly growing our tech team. Do you have what it takes to join our team of expert developers? To find out, we've put together an exercise to test your skills! The goal is to simulate an elevator going from floor to floor, making stops when necessary. Think of this as your training ground to ultimately helping us take our ad tech solution to the next level, on a daily basis! The exercise uses RxJS with functional programming to model the elevator and VueJS for the user interface. As part of the exercise, and to save time, the application backbone is provided. Below is a preview of the exercise, and you can click here to give it a go on StackBlitz - just fork and edit your own version! If you liked this exercise, send us the link to your solution and find out more about joining us at MakeMeReach for bigger challenges! 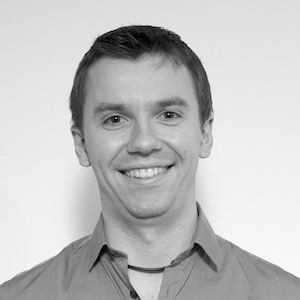 About Nicolas Levaique Our Head of Product, Nicolas has a lot to handle. From managing the MakeMeReach Roadmap, to answering technical questions from Customer Support and advising the Sales team on specific features available to their clients, we're always delighted when he comes to us with a new social media update for a blogpost!